As part of my ongoing series where guest authors review courses from genealogy institutes, this post is by Mike Bronner with his perspective on “Settlers in the New World and Immigrants to a New Nation” course at the Salt Lake Institute of Genealogy from January 2017. New Year’s Day ushers in a two-week period of excited anticipation — final preparations for SLIG. The week of turns into a blur with travel, meeting and greeting new and old friends, and trying to absorb it all! In past years I have concentrated on methodology classes. This year I changed it up a bit and decided to take a history course from Dr. Colletta. I have been looking forward to attending one of his courses quite a few years. He has a wonderful way of sharing his stories through empathy and visual language. Together with Josh Taylor and Deborah Gurtler, Dr. Colletta brought a period of history spanning almost 500 years, starting in the 1590s, to life. The main topics discussed were the pre-colonial, colonial, and federal periods. We delved into the details of what immigrants might experience during these times, what tribulations they faced. We looked at some of the more and some less successful immigrants throughout history with the hope of gleaming a little insight into how different life was in each of those periods. We learned a lot about the push and pull effects that triggered immigration, and sometimes even repatriation. Some immigrants were businessmen who were looking to profit in the new world, and travelled back and forth. Others sought fortune in a new world, where the old world bore none, and then returned on the death of a relative. No Pressure: Dr. Colletta’s class was a wonderful experience. One could relax and soak in the history, social, and political lessons without having the added pressure of homework or research. This also freed up the evenings for my own research at the FHL. Interactive: Dr. Colletta made a concerted effort to keep the course interactive. He encouraged us to interrupt with questions, discussions, and sharing of relevant experiences. It developed into a participatory event in which we were all able to learn from each other. At times he would have to reign the class in a bit, to be able to stay on course with the schedule. Everyone was eager to take part. Story Time with Dr. Colletta: The best, of course, was being able to listen to Dr. Colletta present history through his fantastic ability to paint pictures with his stories. If you have colonial immigrant ancestors, I fully recommend this course, should it be offered again in the future. Mike Bronner (@mikebronner on Twitter) is a free-lance translator who runs GeneaLabs in Los Angeles with his wife Myelene. Besides German-English translation services specializing in old German print and handwriting, they also provide custom web development solutions. As part of my ongoing series where guest authors review courses from genealogy institutes, I welcome my friend Cari Taplin, CG with her take on the “The Coaching Lab: Forensic Genealogy from Inquiry to Affidavit” course at the Salt Lake Institute of Genealogy from January 2017. Forensic genealogy is one of the most interesting and potentially rewarding niches in our profession. The course “The Coaching Lab: Forensic Genealogy from Inquiry to Affidavit” was an excellent course that took the students through the process of handling a forensic case from start to finish. The course was coordinated by Amber Goodpaster Tauscher and Catherine Desmarais, CG, with instruction also by Bethany Waterbury, Jerry Smith, CG, Judy Russell, CG, and Kelvin Meyers. The course began with what a typical day might look like from some practicing forensic genealogists, learned about how they work to attract clients, and discussed some tips for working with lawyers. This course also took the class through the process of building research reports and affidavits in great detail. Other topics we covered were on being expert witnesses, issues in real estate, mineral rights, and adoption cases. Tips on locating living people were also shared. This course was very helpful in that it demonstrated the nuts and bolts of forensic work in great details and took the students through a real case from start to finish. The main portion of the course focused on the actual creation of the forensic research report and affidavits. The instructors demonstrated several tricks designed to save time while also creating thorough reports. Templates were shared that the class customized for their own use. Then we used those custom templates to proceed through a case together, creating the report and affidavit as we worked. We also practiced how to create professional exhibits with labels and source citations. The class size was smaller than other institute courses typically are, but this allowed for a lot of in-class discussion, networking, and class bonding. Students in the class had adequate time to share their own experiences, ask detailed questions, and were given excellent answers from all of the instructors. This course was taught by a team of fantastic and fun practicing forensic genealogists from a wide variety of experiences who were more than generous with their knowledge, expertise, and professional tips. Cari Taplin is related to Roy Rogers. Or at least that’s what her family told her. As a result, she has been working on finding her true heritage since the year 2000. She is a native of Wood County, Ohio but migrated to Wyoming, Colorado and now Pflugerville, Texas which is just outside Austin. 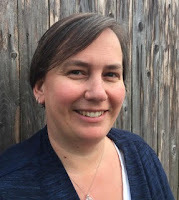 Cari holds the Certified Genealogist® credential and has served in a wide variety of volunteer and leadership positions for several state, local, and national societies. She currently serves as the Education Chair for the Austin Genealogical Society, and on the boards of the Association for Professional Genealogists and the Federation of Genealogical Societies. As the owner of GenealogyPANTS, she provides speaking, research, and consultation services. Cari focuses on midwestern states, methodology and researching family legends. When she’s not working on her genealogy, she is a wife and mother of two/too cute kids. This post is part of my ongoing series by guest authors reviewing genealogical courses. In this article Denise Cross shares her perspective on the new Practicum in Genealogical Research taught by Melinde Lutz Byrne through Excelsior College. "What I Did on My Summer Vacation, or, My Adventures in Genealogical Education"
My first taste of formal education in genealogy was the Boston University online certificate program. It opened a whole world of possibilities I did not know existed. I took every opportunity to learn more and hone my skills. I work full time, so I can do anything that is online and at the right time of day. Webinars, the ProGen Study Group, and local society meetings filled my calendar since finishing the BU course. 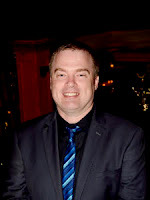 Summer freed me up from my academic year demands and I added travel to the Genealogical Research Institute of Pittsburgh (GRIP) and Western Institute of Genealogy courses. The best thing I added to my intense summer of genealogical learning was the Excelsior College online Practicum in Genealogical Research. The Practicum is one of two new genealogy offerings from Excelsior College. The inaugural semester ran May-August. Melinde Lutz Byrne developed the course for experienced genealogists. Using real world cases, both solved and unsolved, she gave us thought provoking assignments. We tore the cases apart and put them back together. We studied our biases and assumptions to identify them in our work. We took our own unsolved cases and reframed them to make more progress in solving them. In the course of our 16 weeks, we developed our skills underpinned by the Genealogical Standards. I’ve read the standards many times. I have now internalized them. Genealogists who want to further develop their skills for solving cases and writing them up to convince others, should consider this course. It is set up in two week modules with a predictable sequence of assignments and discussions to fit into most busy schedules. If you took the 15 week Boston University course, the workload felt like it was half as intense and took up about half of my time. And yet I felt like I learned twice as much. Both from the course and from my classmates. You will want to have some experience with taking an online course and some advanced genealogy experience such as an institute to meet the expectations of this course. All the information, including a syllabus is at: http://onlinecourselearning.com/excelsior/genealogy/practicum-in-genealogical-research/ . The semesters start September, January, and May. You won’t have to wait long to get started. You’ll be glad you did. Denise Cross is a full time librarian at a community college by day and falls down genealogical rabbit holes by night. She takes advantage of every educational opportunity possible, including the BU Certificate course, Excelsior's Practicum in Genealogical Research, both sessions of GRIP 2016. Writing up the forgotten stories of the people she studies is a passion and a goal of all this education. 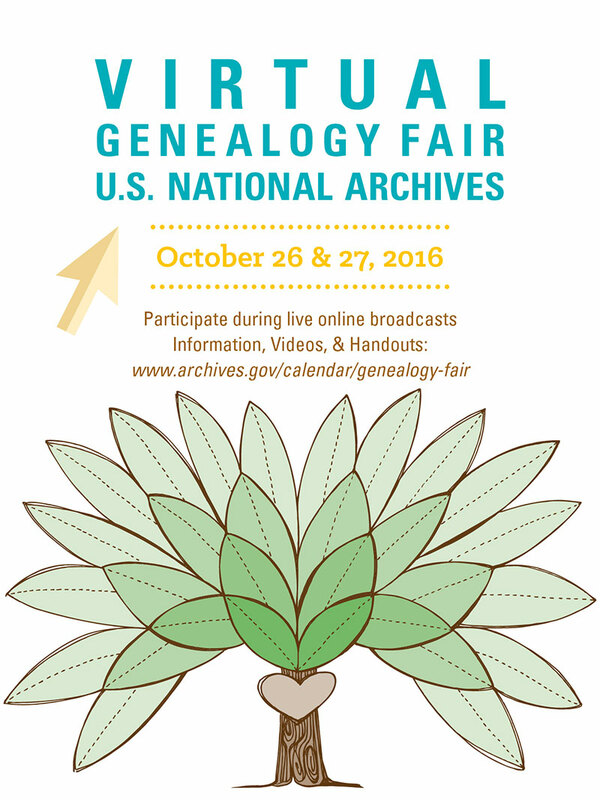 The National Archives has announced the presentation topics for the 2016 Virtual Genealogy Fair which will be held Wednesday, October 26th and Thursday, October 27th, 2016. In this annual two-day event archivists and employees of the National Archives give presentations on records NARA holds that are of interest to genealogists. The fair is free, and can be viewed online. You can download the handouts and follow along with the presenters. You do not need to register. 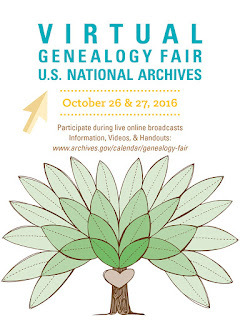 Just go to the link 2016 Virtual Genealogy Fair on October 26th & 27th and watch the sessions live. If you are unable to make it to the live sessions, they will be recorded and available for viewing later on YouTube. The Virtual Genealogy Fair page has links to the web pages for previous years, if you are interested in the presentations. I received the following press release about the Eastern European Family History Conference to be held August 8-12, 2016 in Salt Lake City, Utah. I thought it would be of interest to those of you with Eastern European ancestry. 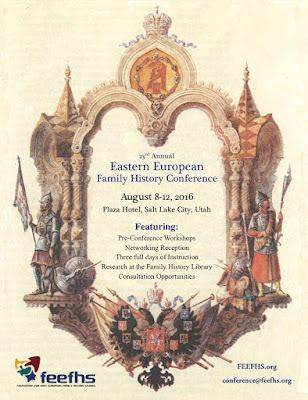 Perhaps the best-kept secret in Salt Lake City is a small, personalized conference on how to do research on Eastern European ancestors. Hosted annually by the Foundation for East European Family History Studies (FEEFHS), the conference is a bit more like a workshop – with intentionally small class sizes to allow sufficient attention to individual questions and needs. The 2016 conference will be held 8 -12 August 2016 at the Plaza Hotel in Salt Lake City. This year’s program is country-research-rich, with a full 3-day track on German research, and extended Polish, Russian, and Austro-Hungarian research tracks. Class instruction levels include getting started research in a specific east European country (assuming a foundational knowledge of genealogical research), as well as more in-depth topics and unique record sources for advanced researchers. Optional consultations are available on a first-come, first-served basis. The 2016 program opens with a welcome reception on Tuesday evening and ends with a banquet on Friday evening, with research time available on other evenings and Saturday at the nearby Family History Library. Two pre-conference workshops will be offered: “Finding the Village of Origin,” which helps participants determine the name of the village their ancestor was born in/came from; and “Learning Cyrillic,” which prepares participants to read records written in Cyrillic Script. Full information may be found at feefhsworkshop.org, with organizational information at FEEFHS.org. 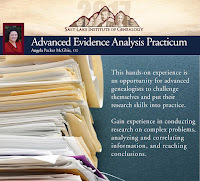 Is The Advanced Evidence Analysis Practicum Right for You? 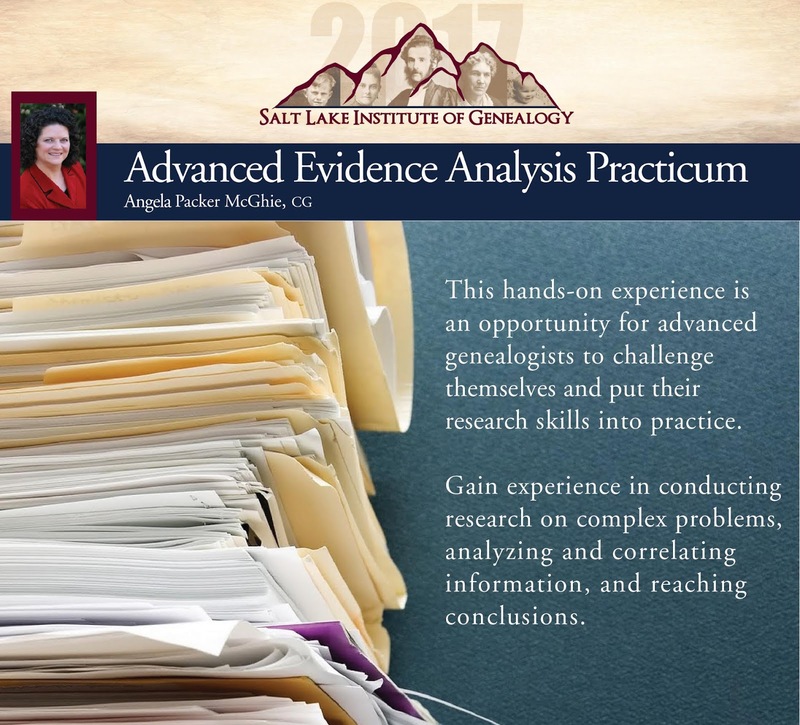 Are you trying to decide if you would like to take the Advanced Evidence Analysis Practicum course at the Salt Lake Institute of Genealogy? Registration opens on Saturday, so I thought I would share some reviews from those who have taken the course to help you decide if it is for you. This hands-on course is an opportunity for advanced genealogists to put their research skills into practice. Participants work on five complex genealogical research problems—a new one each day. Each case requires careful evidence evaluation and/or additional research to solve. The objective is to give each student experience in conducting research on complex problems, analyzing and correlating evidence, and reaching conclusions. The cases are all brand new for 2017 and will feature new methodologies, geographic areas and ethnicities not covered before in the course. For details on the course click here and scroll to the bottom of the course list. This course is designed for advanced genealogists who have sufficient experience and education to work on complex genealogical problems. As I walked the vendor hall at the NGS conference I discovered a brand new opportunity in genealogy education. Today Michael Leclerc is launching a new venture to put genealogy courses online. He has shared with me his press release announcing Genealogy Professor. May 4, 2016 – Boston, MA. Founder Michael J. Leclerc, CG is excited to announce the launch of a new opportunity for genealogy education. Genealogy Professor developed from a passion to provide high-quality independent education to those who want to find their ancestors. Major websites often focus on getting subscribers in the door without considering that most genealogists need a variety of resources to identify the members of their family tree. Our focus is high-quality education to give researchers the tools they need, no matter where those tools are to be found. This includes the incredible resources that are not yet available online that can make the difference between success and failure. Self-Paced Courses are self-contained, so that you can take them anytime, anywhere you like. Video presentations allow you to see the professor and the slides at the same time, letting you to switch your attention back and forth between them. There are also reading assignments and other tasks to complete. Quizzes help reinforce your learning, and give you feedback to help you keep on track, letting you get right to work in your research. Genealogy Masterclasses take online genealogy learning to a different level, with live online classes where the students interact with each other and the professor. Homework assignments may be more complex than Self-Paced courses. And some include one-on-one online sessions with the professor, allowing the students to discuss questions and subjects. These conversations are recorded, with a copy provided to the student to keep for future reference. "There are a variety of genealogical educational opportunities out there," Leclerc says. "We offer a different approach, to help bridge the gap from simple webinars to the complex university courses and genealogy institutes." We believe in giving back to the genealogical community. Individually, we have all spent countless hours volunteering for genealogical societies and organizations, as speakers, writers, editors, board members, consultants, and more. A percentage of the proceeds from our courses is earmarked for support of community projects for work of interest to genealogists. These projects may include records preservation and increased access to materials among others.